Funeral Wreaths are a traditional offering during Wake Ceremonies and other Religious gatherings. We usually deliver our Funeral Wreaths in Bogota with a Tripod Stand and a Ribbon with the name of the person sending the arrangement. We offer Same Day Delivery. Is it appropiate to send Funeral Wreaths to Wake ceremonies in Bogota? Funeral Wreaths and other Funeral Pedestals can be sent to Wake ceremonies, regardless of the relationship with the deceased. 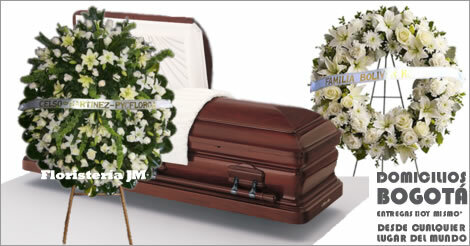 Funeral Casket Sprays are usually sent by family members and those closer to the deceased. Funeral Arrangements in glass vases or Oasis foam are usually sent to the Home of the deceased. We reccomend you send them one day after the ceremony at the cemetery to ensure a successful delivery. 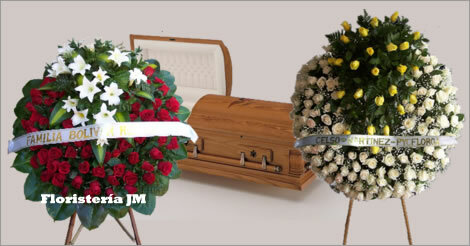 Funeral Combo: Wreath + Flower Arrangement.